Snow brings many risks – especially when you're removing it from sidewalks and driveways. Pulled muscles, strained backs or injuries from slipping all are real concerns. There are steps you can take to help reduce your risk of injury or even death. Shoveling snow is hard work. It’s a good idea to get the blood flowing prior to going out. This can be as simple as a brisk walk around the house, going up and down the stairs, marching in place or doing some chair squats. I recommend a total of 5-10 minutes of exercise to make sure your muscles are ready for activity. You should also stretch your hamstrings, back muscles and upper extremities. It’s important that you wear proper gear that will keep you warm and let perspiration escape while allowing you to move appropriately. Most importantly, you want to reduce the risk of frostbite in the fingers and toes on cold days. Don't forget warm winter boots that provide good traction. Do you know what type of snow you'll be shoveling. Is it fluffy? Is it wet and heavy? Adjust the type of shovel you use according to the type of snow outside. There are different shovels with different lengths, weights and shafts. Here are some examples. It's best to push snow if possible. This can be done using an ergonomic shovel with a curved shaft. Remember to engage your core and use your legs. If the snow is heavy, you may have to lift and throw it. If this is the case, take only as much snow as you can easily lift. Avoid twisting and bending your back. Turn your feet to the direction you're throwing. Don’t throw over your shoulder. Remember: Lift with your legs and not your back! Take your time and don’t rush things. You need to take rest breaks and drink plenty of non-alcoholic beverages to replace the fluids you'll lose. Don’t work to the point of exhaustion, as it will increase your risk for injury. If at any time you feel dizzy, are lightheaded or have chest pain, immediately stop and seek appropriate medical attention. Chances are you may have some aches and pains when you're done. I tell my patients to start with ice to relieve the pain. Over the next couple of days, you can perform gentle stretching. If the discomfort doesn't go away, contact your primary care provider or physical therapist. 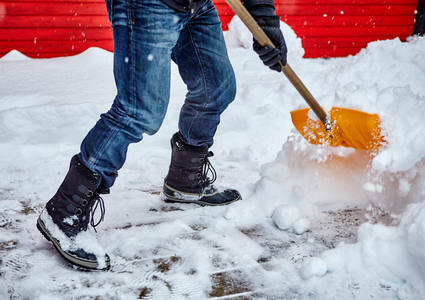 Living in the Midwest, chances are you're going to be responsible for shoveling several times throughout the winter months. If you don’t feel you're healthy enough to do so, ask for help from a family member, friend or neighbor. Don’t let shoveling set you back with an injury. If done properly, you can get in a good workout and burn a few calories! Shawn Harrahill, PT, DPT, is a physical therapist working in outpatient orthopedics, treating patients with spine, shoulder and knee pain. He incorporates manual therapy techniques to improve mobility, increase range of motion, strength and stability and decrease pain. Harrahill sees physical therapy patients at Methodist Physicians Clinic Indian Hills.